It’s fun when a prominent Minnesota musician comes to town. It’s also fun when a non-traditional venue produces programming. 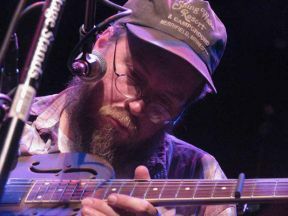 Charlie Parr plays Hogan Brothers Acoustic Cafe this Thursday night (or is it Crazy Eve?). Wednesday, July 21st, Northfield Noontime Organ Recital: Lawrence Archbold, 12:15 to 12:45 p.m., Music and Drama Center on the Carleton College Campus, and Books and Stars: Splatter Sisters, 7 p.m., Way Park. Thursday, July 22nd, CRAZY DAZE, 7 a.m., Downtown Northfield, Sam Daly, 5 p.m., Contented Cow, Charlie Parr, 7 to 10 p.m., Hogan Brothers Acoustic Cafe, The Options, 8 p.m., The Contented Cow, Kim Bloom, 8 to 11 p.m., Tavern Lounge, and Karaoke at Froggy Bottoms. Friday, July 23rd, Northfield Farmers’ Market, 11:45 a.m., Riverside Park, Big Strong Men, 5 p.m., Contented Cow, Tim Freeland, 6 to 8:30 p.m., Butler’s Steak & Ale, Marty Anderson and the Goods, 8 p.m., Contented Cow, and D J Music at the Rueb’N’Stein. Saturday, July 24th, Northfield Farmer’s Market, 9 a.m., Riverside Park, Riverwalk Market Fair, 9 a.m. to 1 p.m., Riverwalk, Carey Langer, 5 p.m., Contented Cow, Wendy Russell, 6 p.m., Butler’s Steak & Ale, RCAs, 8 p.m., Contented Cow, Son of a Gun, 8 to 11 p.m., Tavern Lounge, and D J Music at the Rueb’N’Stein. Sunday, July 25th, Politics and a Pint, 6 p.m., Northern Roots Session, 7 p.m., and Quiz Night, 8 p.m., all at the Contented Cow.